The NWFED is committed to promoting equality and human rights issues in museum and heritage practices and offering a critical platform for new ideas and innovative work. Given the range of recent projects on LGBTQI communities and histories across the North , our May event was an opportunity to celebrate the International Day Against Homophobia and Transphobia and to bring different practitioners together to discuss their practices. We were pleased that there was great interest for the event even from the neighbouring cities of Leeds and Birmingham. John Vincent, author of the book LGBT People and the Cultural Sector, set the day and talked about his experience of ‘coming out’ as a gay man working in libraries in a senior position in the 1980s . In talking about the research for his book he exposed the gap in the knowledge of any relevant cultural practices from the 1960 until 2006. Although museums’ relevant work flourished since 2006 the first presentation on work with LGBTQI communities for the Museums Association conference only took place 3 years ago. Prepare for the work, become familiar with the appropriate language. Check out the objectives for the project and identify its relation to organisational values. Consult and demonstrate the value of the work. Consider what may be missing from specific consultation, focus groups. Find the right people to consult. Link up with others for best practice, sharing expertise, benchmarking. Evaluate your work, demonstrate benefits.. Sustain the trust and the relationship created. The day closed with delegates discussing the problems of mapping, recording and interpreting collections in relation to LGBTQI histories and cultures, the confidence required by museum curators in identifying and speaking with authority about gay identities and historical figures, the importance of Queer theory in overcoming political and ideological differences, the dangers of homogenising different communities and experiences and the opposition to creating tokenist and celebratory events that simply tick boxes. Delegates expressed their concern about the current social tensions and economical challenges across Europe and the dangers they pose to people’s sexual freedom and expression. These final remarks and concerns sum up the reasons for sustaining and promoting our work with LGBTQI communities. Pomogaze the festival of queer cultural events in West Yorkshire is on this summer of 2014 . An interesting conference takes place as part of the festival on Female and Transgender Masculinities at Leeds Art Gallery on the 16th and 17th of June. The Unstraight Museum Conference 13 -14 June at Museum of Liverpool. Imperial War Museum North has created a series of short films discussing the experiences of gay officers in the Royal Navy Forces. Read here an article written recently for the Museum Journal by Head of Fina Arts at National Museums Liverpool Ann Bukantas. We are grateful to all the speakers and delegates for their contributions to the event. Thank you to Mosi for their hospitality. Manchester Museum, Museum of Liverpool, Imperial War Museum North, the Harris Museum and Art Gallery in Preston, St. Helen’s Glass Museum and the Potteries Museum in Stoke on Trent are among the Northern museums featured in the stories selected for the writing competition Inspired by. The competition was launched at the MA conference in Nov 2013 offering the opportunity to selected writers to be included in an international publication. Budding writers were asked to record and share their personal reactions, connections or experiences inspired by a visit to a museum. Entries could be in the form of a poem, short story or reportage and people were able to take their inspiration from the museum space, architecture, design, a specific object or objects within the museum, or even the museum/exhibition curator. Sampad and British Council India are now delighted to announce the list of the entries that have been selected for publication. The winners will be announced shortly. Identifying your museum’s unique offer, using small, specialised collections to engage imaginatively with your audiences and making the most of any available resources are key factors to any museum’s success. 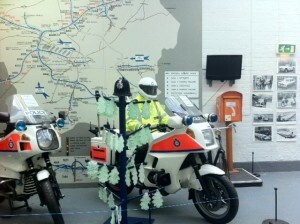 The Greater Manchester Police Museum does all the above well and has ambitious plans for the future. 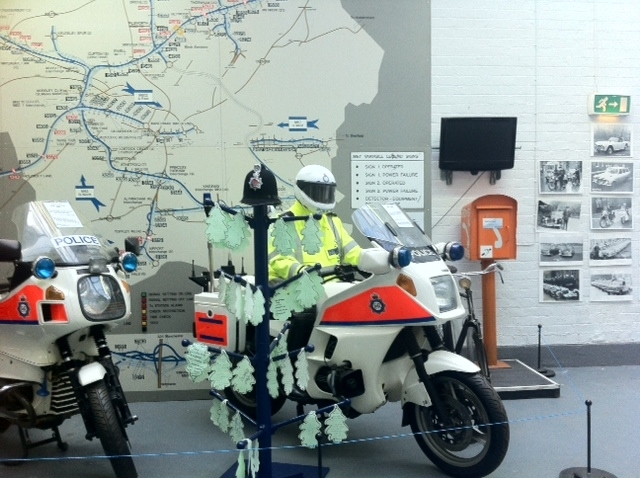 The museum is housed in a listed building which served as the headquarters of the Greater Manchester Police until its evacuation in 1998. It is situated 10 minutes away from the Manchester Picadily station in close proximity to the local colleges and schools. The museum is listed as the 6th best visitor attraction in Manchester, it is free and has 10,000 visitors a year, half of which are educational visitors. The GMPM is also used as a resource for ESOL tutors for familiarising students with specialised vocabulary. The original prison cells and the court room as well as the modern motor bikes and other relevant police equipment are a treat for young visitors! The courtroom is a realistic setting for training new officers in court procedures and legislation and it is also regularly used for filming purposes and fundraising events in collaboration with local charities. Special events are organised in collaboration with the police forces and as the curator Duncan Broady puts it: ” it’s amazing what police on horses outside the museum can do to attract families and new visitors “. The museum team draws upon its relationships with the police not just simply to organise special events but to improve design, to photograph collections and to utilise GMP’s public relations expertise. The Museum has a substantial Flickr presence (https://www.flickr.com/photos/44340545@N05/sets/72157622738919156/) and a significant number of social media followers. The museum is home to the archives and photographs of the Greater Manchester Police forces, an amazing record of social history. Among the museum collections are records of foreign residents in Salford dubbed as the “Salford Aliens”, the name given to all the foreign people who moved to Salford between 1914- 1926. Talking to Katie and Duncan I find out about future plans and ambitions: the ground floor store is soon to move to the basement, freeing exhibition space and improving collections’ storage. Documentation of the collection in Mimsy is under way, and a display on WW1 in August. The team is also looking at ways of generating income and how best to work collaboratively with local communities and organisations preventing hate crime and contributing to social cohesion. To conclude my visit Duncan treats me to the incredible story of Herbert Winstanley the money forger and the investigation that led to his arrest. I recognise in his voice the passion and knowledge that make museum professionals and volunteers unique. High up on the wall is a display of the most incredible weapons people have used to harm others. I consider the impact hate and violence has on people and on society while being reminded of the impact museum objects can have in telling powerful stories and generating dialogue on important social issues. The GMP Museum’s website is currently under construction. 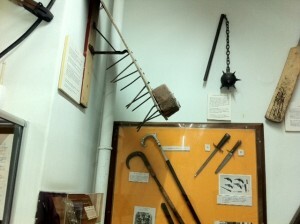 Thank you to Katie Brown and Duncan Broady for showing me around their museum.